Mangroves fulfill an important niche in wetland ecology and play a significant role in modifying the global carbon budget. They harbor and provide shelter for the offspring of many species of water birds, fish, and reptiles, and sequester close to five times the amount of carbon that terrestrial tropical forests do while aiding in sediment deposition and preventing coastal erosion. While much research has been conducted assessing the use of LIDAR in the application of monitoring terrestrial forests, very little has been done with respect to monitoring mangroves and other wetland features. The aim of this project was to begin delving into this void and to develop techniques and best practices that will be applied to my graduate research on the use of geospatial technologies to assess and quantify biometric data on American Mangroves for monitoring “blue carbon” sequestration and net primary productivity. The production of Canopy Height Models (CHMs) for Mangroves within the two Areas of Interest (AOI). Quantification of the above ground biomass volume of Mangrove canopies utilizing differing approaches to address the unique geographic factors in each AOI. Methods for addressing the surrounding and inclusive water bodies within the areas of the AOIs containing Mangroves. Two separate study areas have been used for this project, one in coastal Louisiana and one in the Florida Keys. Each study area is unique in its climate, types of mangrove species, surrounding water bodies, and data types available. For Louisiana, a portion of the Terrebonne Parish immediately surrounding the Barrier Island Refuge (BIR) at Isle Dernieres was selected, as it is rich in Black Mangroves (Avicennia germinans) and small in area. For the Florida Keys, Long Key was chosen as a suitable site for the same reasons as the Terrebonne BIR. While both sites contain high concentrations of mangroves, the heights and structure of the Mangroves at each location vary greatly. The mangrove species in the Terrebonne province are restricted to the Black Mangrove that will only grow to a few meters tall due to lower temperatures in the winter, while the Florida Keys contain a mix of Red Mangroves (Rhizophora mangle) and Black Mangroves that grow to 30 meters or more in height. The LIDAR data quality was also very different, with the BIR dataset almost entirely consisting of first returns while the Long Key dataset had a lower point density (~5 pts/m2 at BIR vs ~2.5 pts/m2 at Long Key) with multiple returns per pulse. 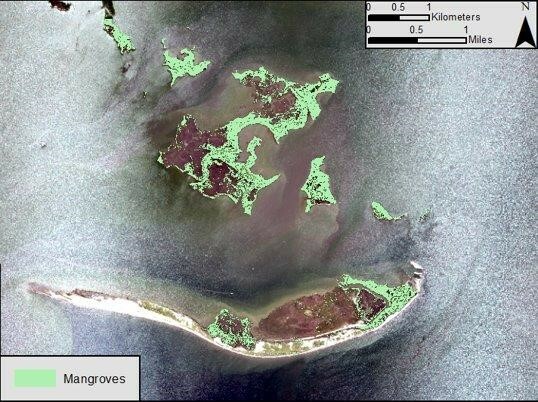 Figure 1: NAIP imagery of Isles Dernieres Barrier Island Refuge (BIR) with mangroves classified in green. This entry was posted in LP360 Case Studies and tagged Canopy Height Models, LIDAR, LP360, Mangroves, wildlife.